Silver Peak engaged Miercom to independently verify performance of the Unity EdgeConnect SD-WAN solution. 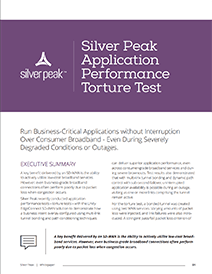 Download the Miercom Report and discover the high-performance and availability benefits of Silver Peak SD-WAN solution, Unity EdgeConnect. Las Vegas Harley-Davidson deploys powerful EdgeConnect SD-WAN solution to fuel business growth. Read the report to learn how Unity EdgeConnect in a rigorous test environment delivers superior application performance, even across consumer grade broadband services and during severely degraded conditions or outages.